90 Capsules for the price of 45! 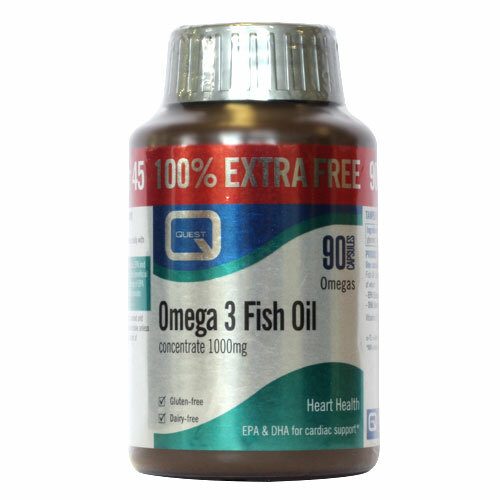 Quest Omega 3 Fish Oil Concentrate is a good source of the omega-3 essential fatty acids EPA and DHA - which contribute to the normal function of the heart. This beneficial effect may be obtained with a minimum daily intake of 250 mg of EPA and DHA. The concentrated fish oil in Quest Omega 3 provides 180mg EPA and 120mg DHA per capsule. Suitable for vegan diets and for people with dairy, gluten or nut allergies. Fish Oil Concentrate, Capsule Shell (Gelatin, Glycerin), Vitamin E (as dl-alpha tocopheryl acetate). Take one or two capsules daily with food. Swallow with water. Below are reviews of Omega 3 Fish Oil - 100% Extra FREE - 45+45 x 1000mg Caps by bodykind customers. If you have tried this product we'd love to hear what you think so please leave a review. Was advised to take these by the hospital. I don't notice any difference, but they tell me that they are good for the heart. Quest are a great, high quality brand. Quest Omega 3 Fish Oil Concentrate is a good source of the omega-3 essential fatty acids EPA and DHA which - contribute to the normal function of the heart. This beneficial effect may be obtained with a minimum daily intake of 250 mg of EPA and DHA.